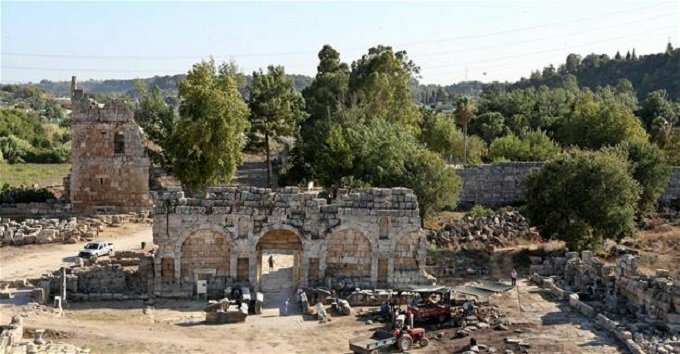 Conservation, restoration and integration works have been initiated for the Hellenistic towers in the ancient city of Perge (or Perga), in the southern province of Antalya in Turkey. The work was carried out by the Antalya Directorate of Surveying and Monuments. Antalya Surveying and Monuments Director Cemil Karabayram said, that the ancient city dates back to the second and third B.C., and that the Hellenistic towers needed to be restored. He also said that the tender had been finished for the restoration of the towers, and the ancient structure was one of the most magnificent structures in the Pamphylia era. Karabayram said the towers were not built in order to show off, but rather for defense. He also said the restoration project had a budget of 2.5 million Turkish Liras, and the work in the towers was actually initiated in the beginning of the 2000s. “Nearly 2,000 stones in the tower were classified. Now the proper stones will be used again in the restoration,” he said. Karabayram said their restoration will be complete in mid-2019, and then the towers will open for tourism. He said the towers were taken under protection in 2007 with the steel construction method, in order to prevent the stones from falling, or a possible collapse. “After the restoration, the steel frames will be removed from the towers. The stones were examined one by one and the project was approved by the relevant preservation board. At the moment, it is evident where most of the stones will go. When the work is complete, we will be able to open 70-80 percent of the Hellenistic towers for tourism. The project will be carried out under the consultancy of academics and scientists,” said Karabayram.